Some people run out of butane before they run out of mats. This may happen either because they forget to turn off their appliance after using it, or because they don?t change their mats as often as is ideal. 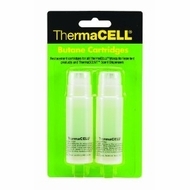 For this reason, ThermaCELL offers a Butane Cartridge blister 2-pack in addition to its regular mosquito repellent refill kits. Refills can be stored for long periods of time and do not have to be used all at once. Refill provides up to 24 hours of energy for ThermaCELL or ThermaSCENT appliances.